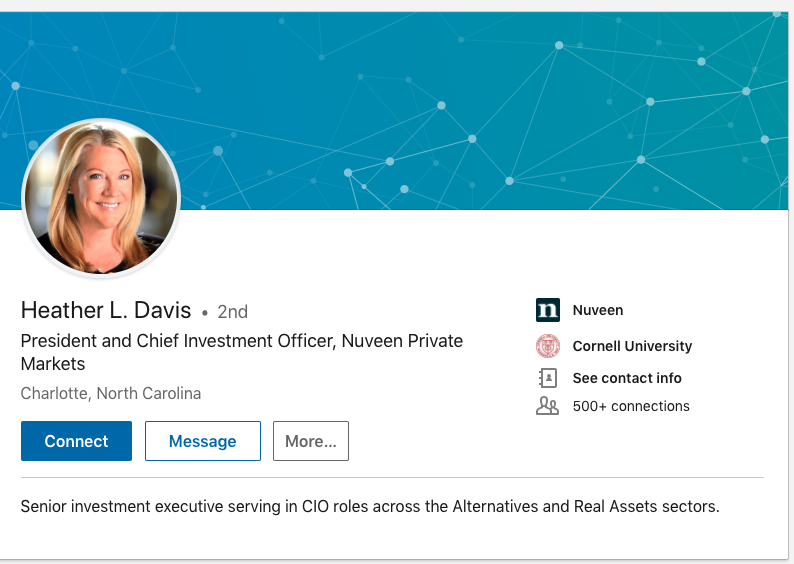 Nuveen’s Heather Davis is leaving the asset manager after 24 years, while four equity portfolio managers are out. Both Nuveen’s private and public markets teams are seeing cuts amid a challenging environment for the asset management industry. In a Thursday memo to employees, Jose Minaya, the $930 billion firm’s chief investment officer, said private markets head Heather Davis would retire. Davis did not respond to requests for comment, and the firm’s spokesman declined to comment. Davis led private equity, private debt, infrastructure and energy for Nuveen, the investment arm of TIAA. Her job is not being replaced, a source said, and the private markets group will report to Minaya, according to the memo.